After a week in FL and a quick day trip to the Jersey Shore, I have all things beachy on my mind! During the CAS-ual Fridays Stamps August release I used the little corals and shells from the Mermaid stamp set, but I hadn't gotten to ink up the main image in this set, the mermaid, and that exactly what I wanted to highlight here. Using masking paper, I cut four 1 x 5 1/2" strips and masked off a white card base. Then I sponged in shades of blue and purple. Next I stamped the coral images in black ink, then I went ahead and removed the mask. I stamped the mermaid outside the sponged area which helps to add flow to the design, as do the sequins. The hearts and sentiment are from the Calm & Loving stamp set. Doesn't it look like the mermaid is blowing kisses? SO cute! Thanks so much for stopping by! Love this Mermaid stamp set? 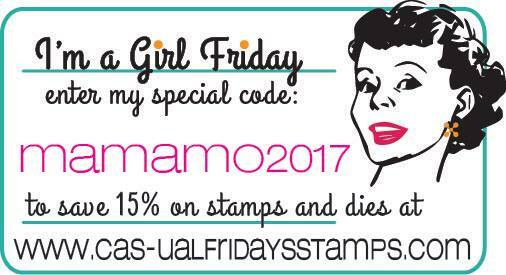 Use my code and save on your next CAS-ual Fridays Stamps order!